Please die. Preferably by gunfire. 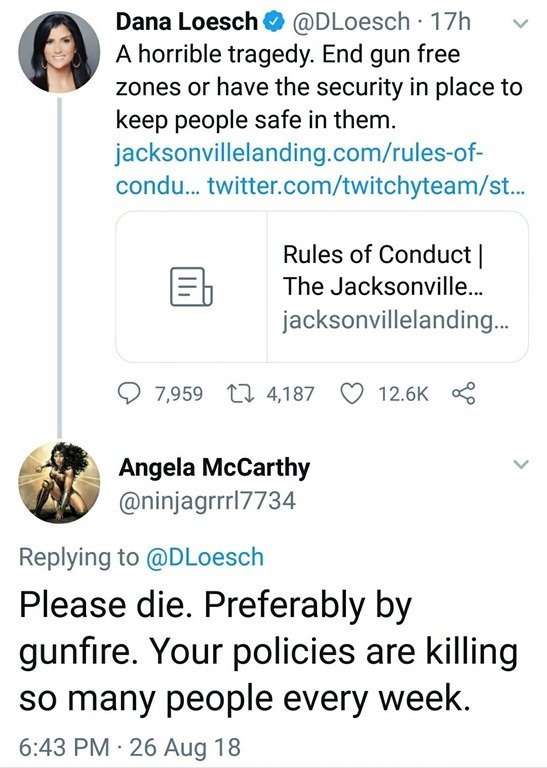 Your policies are killing so many people every week. See also a similar wish for the death of Dana’s children. This entry was posted in Gun Rights, They want you dead, This is what they think of you by Joe. Bookmark the permalink. Thank you, Angela, for sharing with us your *final solution* to the issue of grievance killings in America. I think we’ll go ahead and agree to disagree on this one. 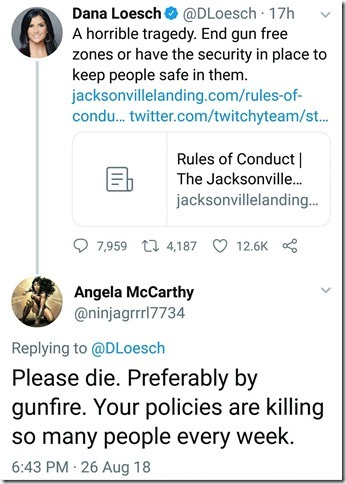 “Your policies” are killing people, and not the actual murderers who apparently are just the misunderstood victims of American, Christian/libertarian ideology. Is that how this works? Actually, yes; that is a description of the Charles Manson, “you made me do it” defense. I didn’t get fat because I use food as distraction and entertainment, but because McDonald’s made me do it. I don’t commit robbery because I lack imagination and a will to work honestly, but because a capitalist society left me no choice. No one shoots up a school full of children because they’re evil, or because they’ve fallen for the left’s constant drum beat of irritation, blame and hopelessness, but because of the asserted right to bear arms equals the right to murder,, etc., etc., etc., et al, ad infinitum. The “warrior princess” avatar is also somewhat telling. Seeing someone who identifies with that image I have to wonder if he or she has much in the way of real, marketable skills, talents, strengths, useful knowledge or other redeeming qualities, or is looking to the coercive power of government to make her feel powerful by proxy. Loesch being a national figure, by contrast, feels no need for anything but a basic photo of herself and doesn’t hide behind imagery.